Wouldn't It Be Great If Aldi Delivered?!!! Okay, so I'm a little guilty of not being loyal to Aldi right now! I know, how dare I do such a thing, but my Aldi is currently under renovation, so that means there's only one store for the city. Have I mentioned before that I don't care for crowds? Well, one store means giant crowds. Not to mention that it's back to school time for me, so no more mid week grocery trips. I do still visit Aldi for the produce because their prices can't be beat, and of course my Aldi faves I can't live without. What I have discovered...online grocery shopping and delivery! It's the best thing EVER! This past weekend I found myself sitting in the living room having that feeling I had forgot to do something. Then I said to my husband, "online grocery shopping and delivery has freed up three hours of my weekend, and I LOVE IT because it's more time with you and the kids!". So, wouldn't it be awesome if Aldi could get an online ordering and delivery system up and running? I love Aldi's !!!! I would love to see Aldis dark roast K-cups sold in large quantities, the dark roast only. It is my favorite, and it seems to be others too, since it sells out alot! 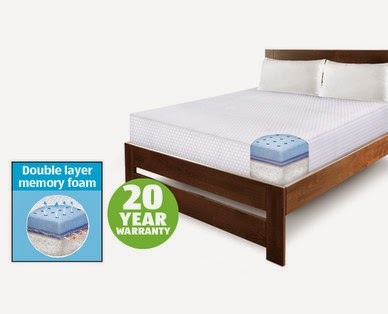 I know this sounds strange to buy a mattress from a grocery store and I have reserved posting about this until I had a month to decide if I liked the mattress or not...but here it goes! I bought my new mattress at a grocery store and I LOVE IT! We are about due for a new grill and I saw they have this one for sale for $139.99. I waited last season to see if there would be one left at my Aldi's on markdown and they all got snatched up quickly. A similar-style gas grill is being advertised at Walmart for $153. I know we usually are the ones giving reviews, but I need opinions Aldi-friends! 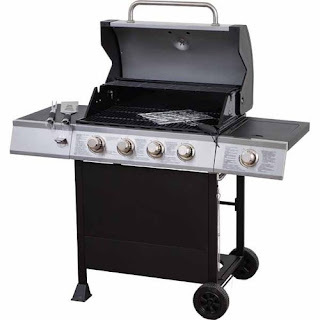 Did you buy this grill when it was offered last Fall or Spring and what did you think of it? How is it holding up? Please leave legitimate opinions in the comments.